About 7,700 people recently gathered in a town in New Zealand to break the world record for the largest haka. The last world record was set in 2014 with 4,028 participants. Haka is a traditional ceremonial war dance of the indigenous people of New Zealand. It will take a few months to verify that the record was set. New Zealand’s rugby team, the All Blacks, have a tradition of performing the haka before every match. 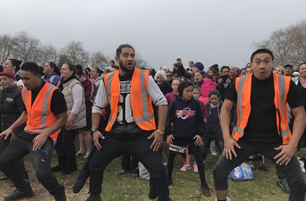 Here is a video showing the record attempt, and another showing the All Black team performing the haka.